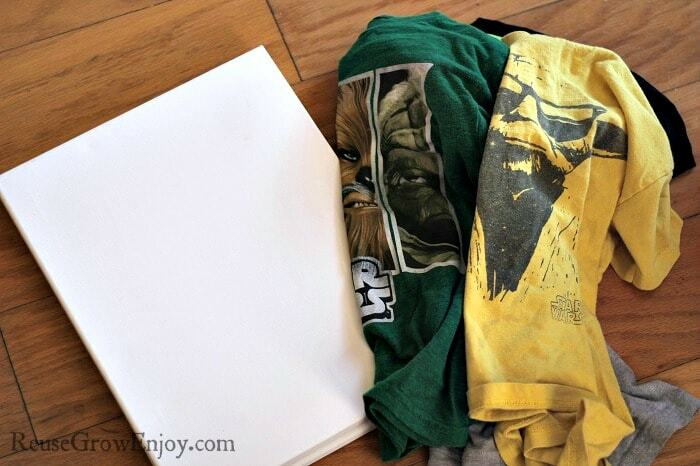 What do you do when your kid has a lot of t-shirts that they love but they have outgrown them or there are hideous stains? 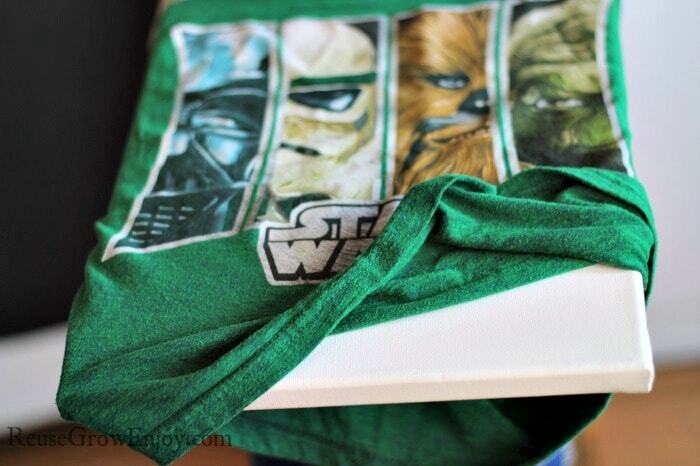 You turn them into something cool, like a Star Wars canvas art! Since a lot of people are either novice sewers or don’t sew at all, no worries. We made this Star Wars canvas art about as easy as they come. If you can use a hot glue gun, then you can make this. 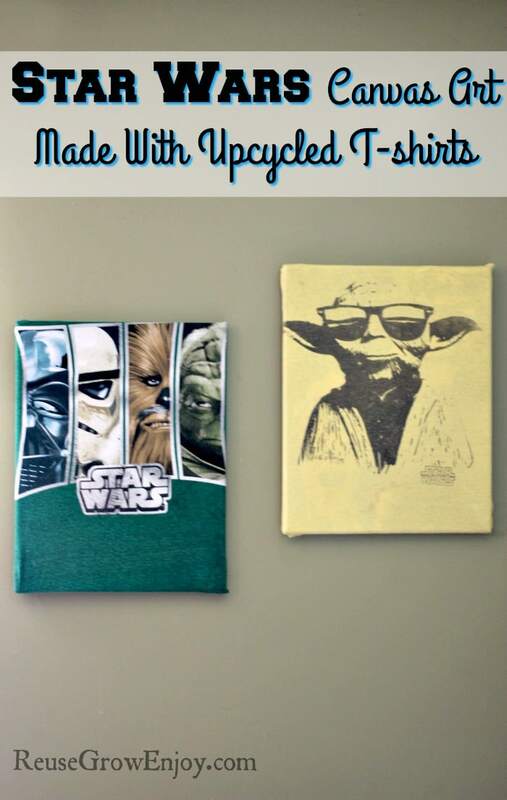 In no time at all, you can turn your child’s small but beloved t-shirt into wall art that pops! You can hang your Star Wars canvas art on the wall from a hook or nail, or it also can go on top of a dresser leaning on the wall. We are using canvas to make this, if you do not have some on hand or do not want to buy, there are a few options you could do. You can either use an old canvas that you no longer want or maybe it is torn (fine to use a torn one) to make this. The other option you can do that is reusing and budget friendly is to use cardboard. Just cut a piece from a box or whatever cardboard you have on hand that is large enough to fit into the shirt. The only reason we made this with canvas is it makes it pop out from the wall slightly. While the cardboard will work just fine, it just will not set out from the wall as much. 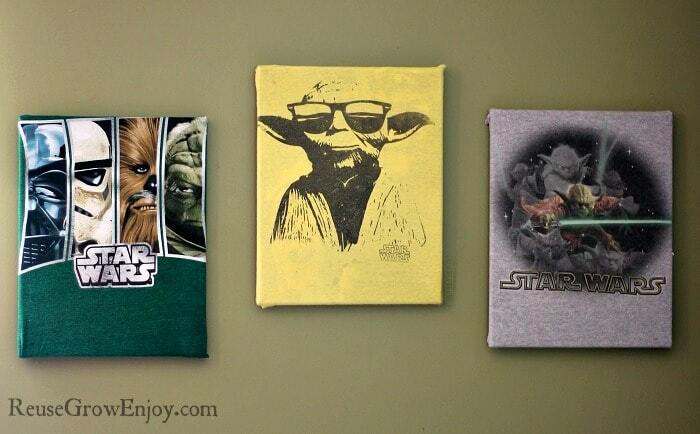 To start your Star Wars canvas art, choose a canvas that fits the design / size of your t-shirt 8″ x 10″ or 11″ x 17″ work great for most kids t-shirts. For toddlers, you may need to go a bit smaller. Slide the canvas inside the t-shirt and center your design where you want it, cut the t-shirt front out leaving 3″-4″ all the way around the edge of the canvas. 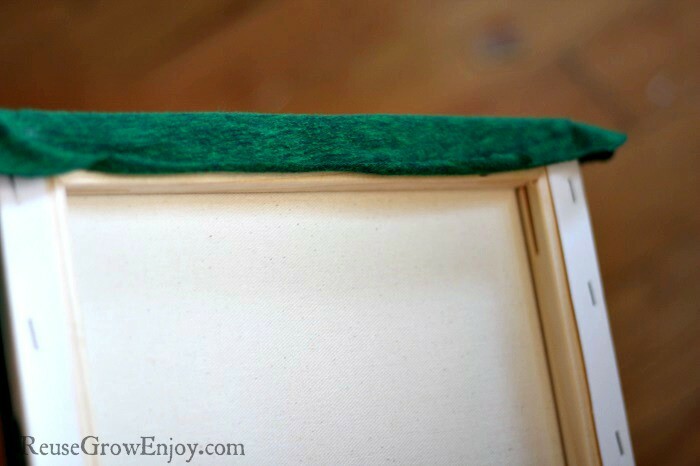 Start at the top and run a bead of hot glue across the back of the canvas frame, smoothing and pulling it tightly down the side, at the other end, and up the final side. To finish off the corners fold them the way you would a gift. Trim the rough edges of your shirt with the scissors to finish it off on the back. You can do this with any themed shirts your child has from their favorite cartoon character to a teens rock band shirt and create inexpensive fun projects as a surprise or as a project to do together. If you liked this reused craft, here are a few others you may want to check out.